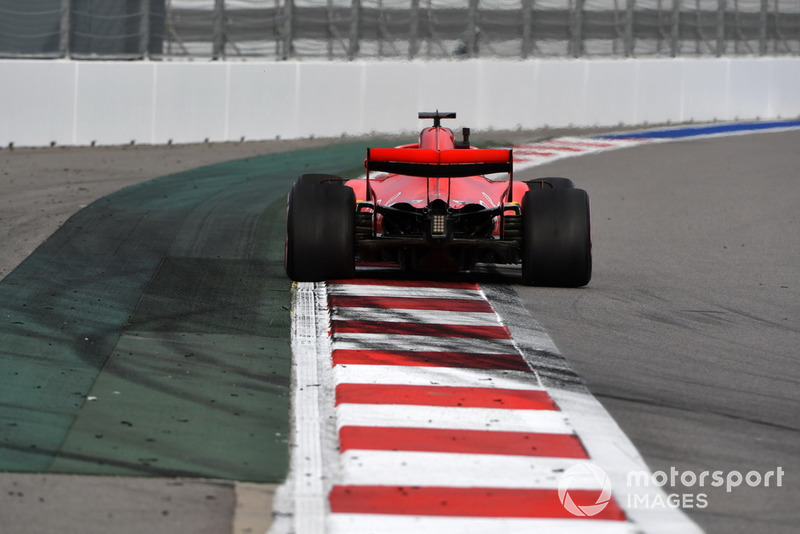 Wholesale changes were on the menu for Ferrari in Russia, as the team introduced a significant update package for the front-end of the SF71H that hints at a new concept direction for the team. 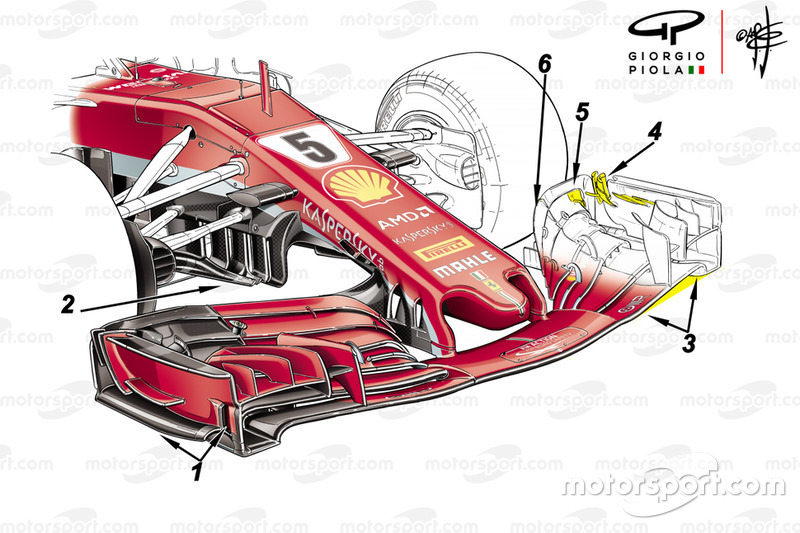 Ferrari's new front wing blends the current concept, some ideas used by Red Bull and innovations that now make sense based on the team's understanding of the 2019 regulations. Ferrari's design team has incorporated the novel footplate solution pioneered by Red Bull in 2017 and tested by Ferrari in Hungary, featuring a raised and inclined footplate that's also pushed back from the wing's leading edge . The endplate design also comes straight from the pages of the Red Bull playbook, with the leading edge shaped in a way that entices airflow to converge on the vertical slot behind . These alterations make the outer section of the wing less sensitive to pitch changes and result in a less volatile footplate vortex, which is subsequently less likely to burst. Making such bold changes to the outer part of the wing has resulted in the design team having to make adjustments elsewhere too. The upturned profile on the leading edge of the mainplane  is a little more pronounced, altering how the airflow behaves, whilst the furniture  on the inside of the endplate designed to control outwash has also been revised. Coupled to the change in the mainplane's geometry and the resultant affect the other changes have had on the wing's ability to create outwash, the flap geometry has also been amended. An additional slot has been made in the outboard section . Perhaps more importantly, the team has toned down the aggressive transition between the tunneled outboard section of the wing and the flapped region . Ferrari has also focused a considerable amount of attention to an area of the car that had thus far been relatively untouched throughout 2018 - its turning vanes . The relatively simple design used so far this season has been cast aside in favour of a much more complex set of separate forward reaching elements. Where the slotted design previously used favoured a more gentle approach to realigning the flow, it's likely that the new design works the airflow much harder, setting up a stronger vortex to feed flow downstream. The team was initially seen using its new rear wing endplate design in tandem with the spoon shaped rear wing elements, in order to reduce drag on the straights around the Sochi Autodrome, but had to revert to a more conventional setup to improve balance.